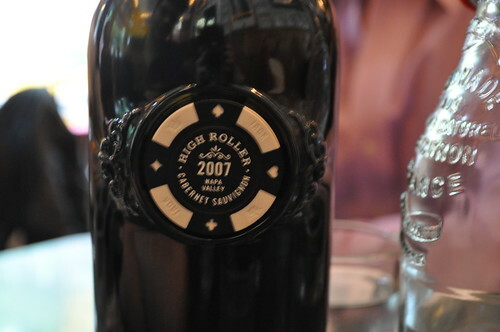 After the phenomenal JAQK Cellars wine tasting at Bacchus Wines we attended back in March, I couldn't help but purchase a bottle of its flagship wine, High Roller, a 2007 Cabernet Sauvignon from Napa Valley, because of its profound taste and smooth texture. I wanted to get a bottle for her birthday, so I promised Jess that I would share it with her over dinner on her birthday. I wanted it to be a birthday gift from me that we could enjoy together! So how would we share the wine? What would be the best way? we asked ourselves. The restaurant choice had to be a BYOB for this amazing bottle of wine. Accordingly, I suggested to Jess that we go to Tartine in the West Village to celebrate her birthday last weekend, as it is a great BYOB restaurant that had no corkage fees nor any limits on the number of bottles you could bring. It also received high ratings and great reviews regarding its food and menu offerings, so it seemed to be the perfect choice for what we were looking for. Tartine is a small corner restaurant located in a quiet neighborhood street in the West Village. Its space is very intimate, so as long as you don't mind tight quarters, informal waiting lines (the restaurant has a no reservation policy--there isn't really a mâitre d', and there is no maintained list of waiting customers), and informal service, Tartine is a great place for a casual evening meal. We arrived a little before 7 PM, concerned that there might be a line of people waiting for a table. Luckily, it wasn't crazy crowded yet, and we were seated in about 10 minutes. As for brunch, I've heard the line gets pretty insane, so I would err on the earlier side so a longer wait is avoided. Immediately after we were seated, we asked our server to uncork the High Roller wine that we were so desperately waiting to open over the last couple months. We nearly forgot how it tasted until we were reminded again with a simple drop from our glass onto our tongues. It was the familiar flavor of peach--full and round--with a powerful aroma and an elegant taste. With my memory refreshed, I'm going to try to pick up a couple bottles during my upcoming trip to San Francisco and send them back to New York, if possible. I'd love to save a bottle for aging over the next few years to see how the taste develops and matures over time. Jess and the new guy in her life, Michael, started dinner with the Bluefin tuna tartare with avocado salad, cucumbers, and radish, topped with a few tortilla chips. 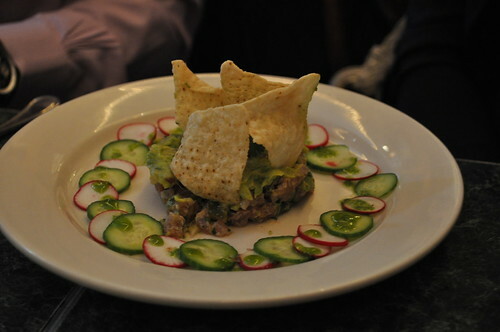 They reported to me that it was a really good tuna tartare dish--my best guess is the inclusion of avocado (because we all know avocado makes any dish better--for the most part, haha) as well as the sliced vegetables surrounding it. It tasted refreshing and light, making for a complementing starter for the heavier dinner course ahead. 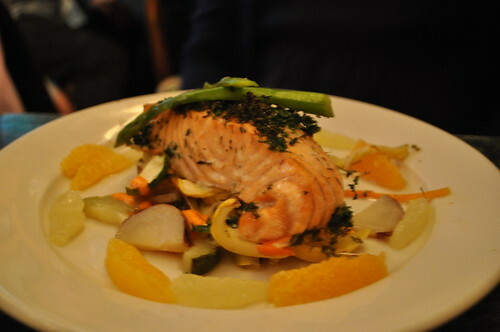 Jess and Michael each had the grilled salmon with citrus vinaigrette and julienne of vegetables as their main course. They also enjoyed the salmon very much--it was evenly grilled to the perfect temperature for eating. The citrus vinaigrette added a tanginess to the fish as well as the vegetables, which rounded out the dish as its side. I went with one of the specials offered that day. I can't remember the exact description, but I believe it was a pan-roasted duck with a resulting confit sauce, peppercorns, assorted herbs, apples, and a variation of au gratin hash. I was very pleasantly surprised at how incredible this dish was. 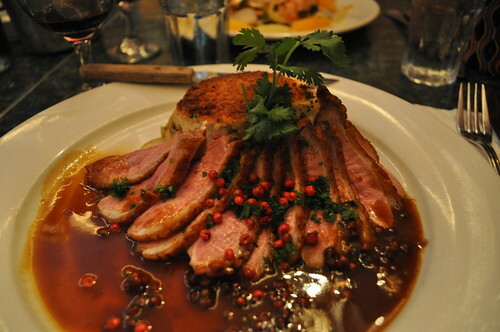 This small French bistro prepared this duck to the desirable medium rare temperature that gives the overall dish a meatier flavor and a succulent texture. It was soft, and the accompanying sauce worked well with the duck--it didn't take away the amazing taste of the duck. Instead, it added a sweet-and-salty enhancement to it overall. If you see duck on the specials menu, I'd recommend ordering that! 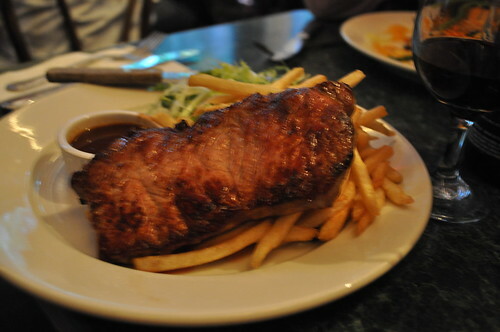 Marcus ordered the grilled sirloin steak with french fries red wine bordelaise sauce--the classic "steak and frites" Marcus found the steak to be really soft and the overall portion to be an ideal size. The fries were seasoned nicely as well. And really, how can you go wrong with a red wine bordelaise sauce paired with perfectly prepared steak? While we were eating our main courses, we had our server uncork another bottle--the High Roller was gone so quickly! This wine is by CC: (Betts & Scholl)--a 2007 Cabernet Sauvignon. Jess and I had attended a wine class back in December at New York Vintners, a modern wine shop located in Tribeca, entitled Wine 101: A Sensory Guide. We had tasted some great wines during that two-hour class, which I found to be quite rigorous compared to wine tasting classes I've attended previously. We really enjoyed the class, and each bought a bottle of the CC: Cabernet. What we really liked about it was that it is a special blend of grapes--a collaboration with one of the world’s most special vineyards and wineries--which has this really interesting spiciness to it. CC: Wine is committed to its motto that "wine as a grocery, not a luxury," which a very different approach from what I've seen in my exposure to the wine industry. 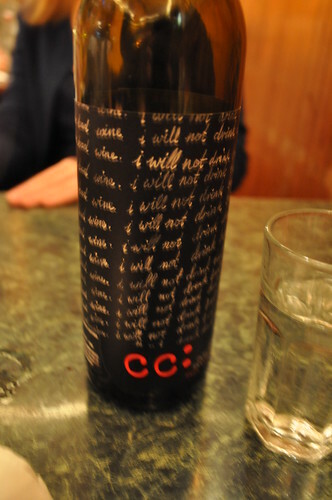 Plus, the added detail of "I will not drink bad wine -- I will not drink bad wine..." printed all over its label is very cheeky--I find it great when wine companies have fun with their branding. Jess still had the wine on her kitchen counter, so she suggested we bring it along to dinner as well. To both mine and Jess's surprise, the guys actually enjoyed this one very much--they both even went on to say that they preferred it more than the first one from JAQK Cellars. As for Jess and me, we also forgot how much we liked the CC: wine--finally opening it that night helped us remember the unique blend that we had tasted back in December. I wouldn't go far out to say which one I like more--I think that's a tough call (and I'm sure Jess would agree) because they're so different in my mind. I just know we've found two solid tasting red wines that I know go well with many things. 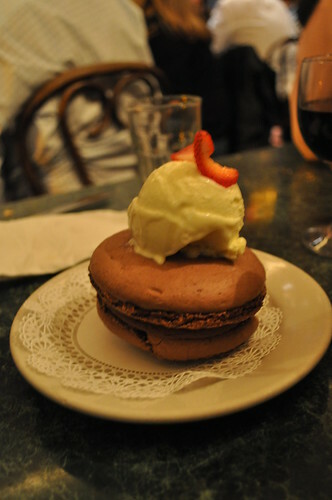 For dessert, Marcus had the chocolate macaron a la mode, a chocolate meringue (i.e., what the "cookie" of a macaron is made from) filled with chocolate ganache, topped with vanilla ice cream. Marcus simply told me that it was delicious. For me, it's like asking a macaron that happens to be gigantic? Topped with ice cream? You had me at gigantic macaron! 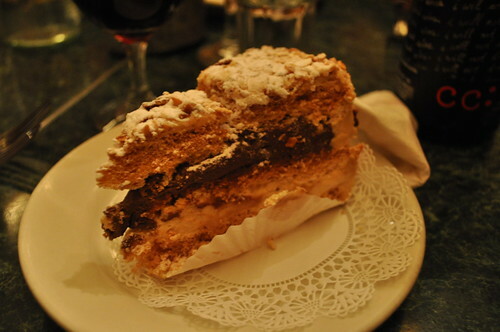 As for me, I went with the dacquoise, which was a chocolate ganache with praline butter cream, meringue, and hazelnut, covered with toasted almonds. I couldn't help myself here--I'm a total sucker for hazelnuts and chocolate ganache. As heavy of a dessert as it sounds, it was actually very light. I recommend this for those who like to end their meals with something sweet without being too much after a rich and heavy dinner. 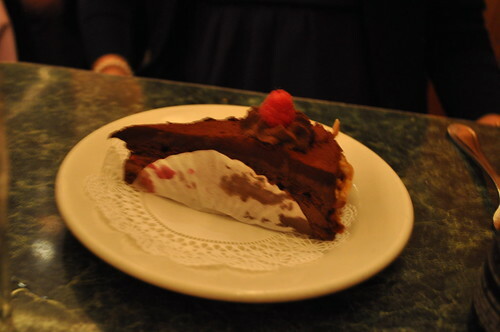 Jess and Michael shared the chocolate marquise, a chocolate ganache and genoise cake with raspberries. From what I remember them saying, they also found this dessert to be great, too. How can you really go wrong with pairing dark chocolate with the tartness of raspberries? That's right--you can't! 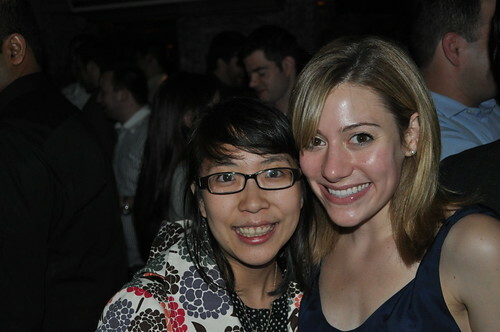 Me and Jess, later that night, celebrating her birthday! Findings: I was sincerely surprised by how great the food was at Tartine. I learned about this awesome restaurant via New York magazine's website, where I noted it was a BYOB that had received a "Critic's Pick," so it had to be at least decent enough to receive that title from the magazine. While I expected the food to be ordinary and acceptable, Tartine severely proved me wrong. 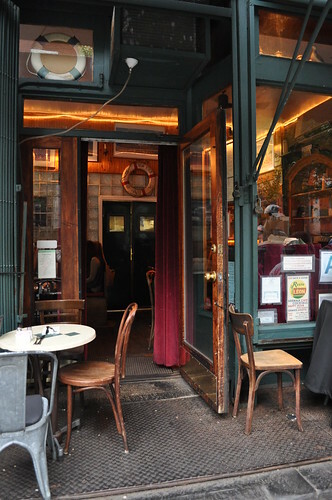 Its prices for really well executed French fare make it one of the best deals in town, in my humble opinion, especially as New York City tends to boast incredibly high prices for French cuisine. So what more can you really ask for? 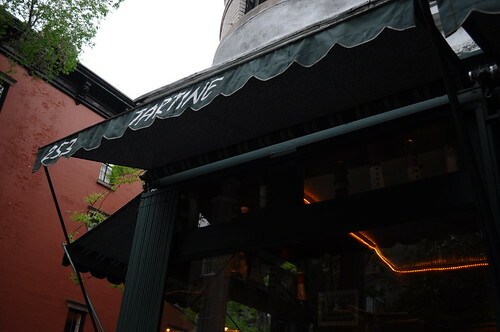 Tartine is a quaint French BYOB restaurant in the heart of a quiet block in the West Village that is very reasonably priced. I recommend getting there early, whether you decide to go for brunch on the weekends or dinner on any night of the week, to avoid the infamous lines that Yelp reviewers always address in their reviews. I'm glad we had such a great experience at Tartine--Jess's birthday was definitely celebrated with the most delicious of French fare paired along with complex-tasting wines from California. You know it's an extraordinary dinner when there were no disappointments. None at all. Price point: $12 for the starter, $23-24 for each main course, $6-6.75 for each dessert. oh tartine! i went here for brunch once and recall how tiny the place was. i was definitely sitting up against a window.